Toussaint Giroux, baptized 02 November 1633 at Réveillon, France, son of Jean Giroux and Marguerite Cuilleron (also as Quilleron) of the village of Réveillon, department of Orne, ancient province of Perche, France, married at Québec city on 29 September 1654 to Marie Godard, born 1641 in France, died 1684 in PQ. Toussaint married a second time at Québec city on 29 October 1686 to Thérèse Leblanc, widow of Pierre Vallée. Like his father, Toussaint was a weaver by trade. The town of Réveillon is located 2-1/2 miles south of the city of Mortagne-au-Perche. Hamlet of Réveillon is four kilometres south of Mortagne-au-Perche, France. 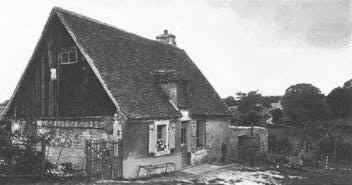 When he left the home of his birth in Réveillon-au-Perche (above), Toussaint Giroux built a replica of it in Charlesbourg, Québec located a short distance north of Québec city. Some of his descendants did the same in Bonfils, Missouri. 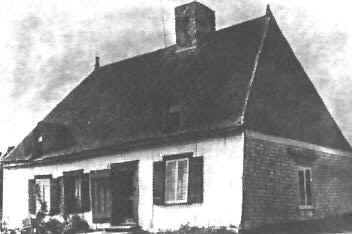 Home of Toussaint Giroux in Charlesbourg, Québec.